Quentin Wallis was not dead but neither was he entirely alive. He was something very much ‘in-between’. In short, Quentin Wallis was cursed. For a century he had been fated to live only on Halloween, seeking out his true love so that he might break the curse which had been laid upon him. The tricky situation was no treat when faced with bad men, murderous ghosts and an inconsiderate army of assassins determined to kill him. With only an honest heart, a haunted house and lashings of candy to assist him Quentin must resolve the small matter of an almost kiss, and a girl with wild grey eyes. And as night falls, and the bonfires burn, the greatest of all adventures begins. There were so many inspirations and so many reasons that I wrote this book. I’m unashamed to say that Halloween, which is one of my favourite holidays, was a primary consideration. I’d been wanting to use it as a setting for a while and my original intention had been to write a very straight gothic fiction, like Frankenstein, Dracula or The Mysteries of Udolpho where the love story took centre stage (which is something I don’t usually do in my writing). Inevitably though my rather dark sense of humour crept in as I was developing the idea, and I drew on a much broader set of literary, film, art and other sources to create a modern day shadowy fairytale. Hopefully it’s all added something to the various layers of what became a darkly funny Halloween love story. 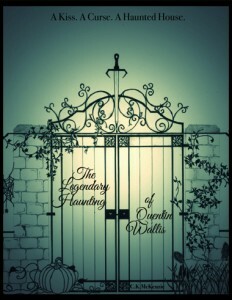 I like to create characters who are unusual, quite often they’re outsiders too, and ‘The Legendary Haunting of Quentin Wallis’ gave me plenty of opportunity to do that. I even got a little carried away and ended up with more ideas for characters than I could possibly ever use in one book. Again, I took inspiration from a number of places. I always try to remember that even if a character only appears once, they still need to be well rounded, they exist far beyond the limits of that short appearance. Quentin really evolved over time. Initially he grew out of the situation that was created. The moment that I decided to include a curse within the plot I thought how fun it would be to play around with the usual stereotypes, where it’s the girl who’s cursed and who has to wait around to be saved. It then became a balancing act to explore the idea of the leading man being cursed without making him too much of a victim. As it turned out the further I pushed Quentin into being an unconventional leading man the more sense he made. In contrast to Quentin’s evolution Nell pretty much stepped onto the page fully formed. Once upon a time it was autumn in the golden city of New York and the sparkling metropolis had pulled on its gilded mantle of russet hues so that it might celebrate the most glorious season and the best of all holidays, namely Halloween. A honeyed glow had enfolded the city bathing the broad avenues in the soft light of short days. Flashes of flame red were reflected back into the city by the mirrored windows of elegant skyscrapers and the resplendent titian leaves fell like confetti against the cloudless ice blue morning sky. Nestled amongst the dreaming spires and the dedicated towers of capitalist dreams no place looked more beautiful, nor more serene, than Central Park. As always the park waited patiently, full of expectation, a constant presence for those who would need it most. It was here that a gentle breeze danced its way through the especially beautiful and well behaved bowers, the slow falling leaves waltzing with the dappled light. Dew clung to the grass, sparkling like diamonds, as the sun slowly rose above the day bestowing upon the morning the perfume of passing summer and the promising bite of winter to come. Amongst the swathes of autumn foliage and fecund beauty lay the spooky and mysterious Halloween adornments that waited impatiently for what the night would bring. There was magic in the air, and if you do not believe in such things then you simply have not been paying attention. It was impossible to miss. There was also a generous pinch of mischief, a scented wisp of promise and the palpable aura of electric anticipation because on that day there was to be a wedding. To the casual observer this was a wedding much like any other, however we are not casual observers, and this was to be a wedding, and a day, unlike any seen before. In an elegant church not far from the park no expense had been spared as the colors of autumn had been thrust aside for a more unseasonal palette of pink, pink and pink. Good taste had been similarly abandoned by the preening, restless guests who filled every pew eager to outshine each other and equally ready, willing, and able to steal the limelight from the bride should the opportunity arise. Rarely had such a group of craven attention seeking individuals been assembled. Needless to say they were all “close friends” of the mother of the bride gained during Vivienne’s years of rampant social climbing and self promotion. These were people who were willing to fake good will for a free meal, an open bar, and a chance at the paparazzi. For the aforementioned mother of the bride the wedding was the culmination of years of planning and the key to achieving her greatest ambition; an ambition which was fuelled by her love to two things. Herself. And Money. Lots and lots of money. There should be no doubt that no matter what she did, or how she did it, Vivienne’s ambitions were entirely motivated by greed, self interest and the misapprehension that she was, without exception, the most important person to have ever existed. And she was certainly not the only one as this tale concerns many such individuals. So many litter these pages that you may, in fact, be in danger of mistaking this for real life. Born into a very rich family she had never learned the meaning of the word ‘no’ which is why she always did what she wanted to do at the precise moment she wanted to do it. This in itself would not have been a problem except that what she wanted to do was crush other people, steal their money, and make them cry. However no matter how much money she had it was never enough and once Vivienne had spent all her own she decided that it was time to spend other peoples. For Vivienne there had been no depths to which she had not stooped, nor limits to the number of people she had stepped upon, in order to realise her desires. However one ambition had proved difficult to attain thanks to the inconsiderate actions of her former, or rather very dead, husband. While her plans had been viciously thwarted in her opinion, Vivienne had ultimately viewed it as only a temporary set back as there remained only one person standing between her and the big pot of money she had married Matthew Hallow for. Once the anger and bitterness had subsided from a rolling boil to a gentle simmer she had risen to the challenge and the rather creative solution to her problems had brought her here to this wedding. In her opinion the plan was perfect, much like herself, and had her face been allowed to freely express emotion, the triumph she felt at finally giving away her only child for something that she wanted far more would have been clearly evident. It was in these awkward and rather forced conditions that the wedding party finally arrived. The bride wore white, her mother wore red, and the groom, as he waited at the altar, wore a look of barely restrained greed whenever he thought about the size of his future wife’s fortune. As Nell, the beautiful but ghostly pale bride, stood upon the steps of the church she shivered a little. The towering gothic spire of the chapel cut the sky like a knife and cast a deep shadow down upon her like the waiting blade of an executioner. Dark clouds were gathering on the horizon, the promise of an autumn storm stealing the sunshine, and the long fingers of the wind toyed with the hem of her dress. Amid the rapacious squeals of the bridesmaids Nell took a moment alone and looked skyward in search of, well, something. I can tell you with some authority that beneath her veil there was no blush upon her cheeks or smile upon her lips. There was only an impending feeling of doom lurking in the pit of her stomach. It sulked there like a rabid monster that had taken it upon himself to snack upon her insides. Her cold feet, which had started as nothing more than a chilly toe, had become so numb that she could feel nothing below her ears. She felt as if she were standing on the precipice of indecision. As indeed she was. It was not the first time that she’d felt this icy feeling settle on her heart but the slightest murmur of doubt from Nell had always been quickly silenced by her mother stealing her words and thrusting a cup of tea into her hand. After every cup Nell had always felt much better, unable to remember her doubts clearly. Oddly enough, after every cup of tea it had been a struggle for Nell to remember anything at all. It was as if the steam from her tea settled into her mind, wrapping it up tight in nebulous restraints. In her more fanciful moments Nell had imagined that she had seen things in that mist of tea, a swirling cacophony of images, silent and sinister, that cast a shadow and made her mothers eyes burn bright with determination. Such things, Nell told herself, could not be possible and yet the confusion had left Nell unable to do anything much less put words to her despair. It was only in her most quiet and tea-free moments that Nell was able to admit that her doubts were perhaps due to the fact that her father was unable to attend the wedding on account of his inconvenient, and somewhat suspicious, death. But even as she stood upon the steps it was not only her father that she thought of, but rather the last thing that he had ever given her; his notebook. This notebook was special for many reasons and it could easily be described as magic such was its hold over Nell’s heart and mind. Small enough to nestle in the palm of a hand, it’s leather cover was so worn with age that it was soft like butter and as supple as a cloud. It’s thick parchment pages, rich cream in color and numerous in number, smelled of vanilla and caramel and the silk waistcoat pocket Matthew Hallow had always kept it in. It had been the receptacle of his most closely guarded secrets and the font of all mystery for the childhood Nell. For Vivienne, it was the key to the money she dreamed of. It was also the one thing that Nell had refused to give her and was therefore also unwelcome proof that Vivienne’s stringent routine of passive-aggressive manipulation designed to crush Nell’s annoying desire to think and act for herself had failed. Nell had protected the notebook just as she protected the memory of her father, burying them deep in the lonely mausoleum of desolation. At this moment though, as she was poised on the precipice, it was the memory of the notebook that seemed to needle her back into reality. The signal was given. The string quartet played; and as the soft strains of music filtered through the church’s open doors Vivienne leaned in close to her daughter. But she did not kiss sweet Nell upon her cheek, nor did she whisper words of encouragement or soft endearments. No dear reader it was a hushed reminder that Nell must not screw this up. After all, it was, in her mother’s opinion, a miracle that Nell had found a man to marry her in the first place, never mind the handsome, charming, well dressed example of a Frenchman that Pierre appeared to be. Determined to prove her point Vivienne listed each of her daughter’s faults and made it exceptionally clear that Nell was in all things a disappointment. To any reasonable person this might seem a harsh assessment, especially from one’s own parent, however Nell had heard it so often that she simply listened and smiled and accepted the words in the (mean) spirit in which they were given. After all, Nell was the first to confess that she was indeed a deviant amongst human beings, an individual so odd that she could not be surrounded by anything other than the general disapproval of others. She had learned long ago that the world was not kind to individuals like her; individuals who were in possession of a brave heart, a curious mind, and an adventurous spirit. Although Nell was far too modest to believe this about herself. She merely believed that she was just a little too weird to be normal, her thoughts a little too strange to be understood and she rarely sought either the approval or the company of others. To make matters worse, in addition to these marvellous gifts, Nell had also been blessed with an excess of common sense and possessed the audacity to apply that common sense whenever and wherever she could. Taking all that into consideration you can fully understand that she was destined from the first to be an outcast. However, even those blessed with such gifts are not immune to making bad decisions, such as drinking tea that had been laced with far more than a delicate squeeze of lemon. Luckily such failures of character are rarely permanent. It was as Nell listened to her mother’s words, with the memory of the notebook fresh in her mind, that she caught sight of her beloved and realized that he wasn’t; her beloved, that is. He was a thin veneer of a man and her feelings had been nothing more than a cruel trick of the light. The temporary satisfaction of a fearful longing, and a bad but not yet fatal case of self-delusion. In that moment it was as if she were finally waking from the dream within a dream that had held her in its gaping jaws. Her eyes flew wide as she finally saw everything as it appeared to be. In the blink of an eye she imagined all options, weighed up all possible outcomes, mentally listed the pros and cons and after all due considerations had been made she took her chance, cut, ran, bolted in fact, not down the aisle but in the opposite direction as far and as fast as her kitten heels could carry her. And so, you will be pleased to hear, that it was with winged feet and flights of fancy that Nell made her escape.